- RUSSIE : Veliki Novgorod -A pagan mask made almost one thousand years ago, has been found at 13th Troitsky Pit in the historical center of Veliki Novgorod. According to the head of the pit Victor Singh, the mask with openings for the mouth and eyes, most likely, cut out from the top of a long leather boot, has been found out in the cultural layer of the 12th century. The back part of the mask has holes for small straps or cords, which were fastened at the back of the head. 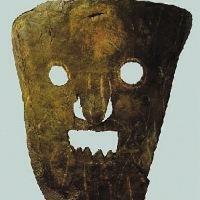 The mask was probably used during some pagan rites. The archeologists have already found around 20 masks. - U.S.A. : Lancaster - "We've found spear points dating back to 3000 B.C. and pottery that goes back to the 1300s," said Meg Schaefer. "We've even found evidence of what Natives were eating, including carbonized nut hulls and fish scales, which we can carbon date." "We don't know if there was a settlement here. It could have been a seasonal encampment. But I think, clearly, more work needs to be done, since we now have evidence that there were people living in what is now Columbia all the way back to around 3500 B.C.,". The reason for the dig has to do with an excavation on the former 1728 home of Samuel Blunston, an early settler in the area. - U.S.A. : Georgetown - D. Bertrand was planting jasmine in his garden when his shovel hit what he thought was a rock. The object, after he washed away the mud, appeared to have a tiny, human face. There are crosshatch marks on the object, which appear to have been made with a thin, sharp edged object. The object has a hole in the top and bottom and appears to fit on a necklace, stick or a fishing net. It is about the size of an egg and has a hollowed out back. It appears to be made of unglazed clay. It closely resembles artifacts that come from the Deptford period. The Deptford culture was from 2500 BCE to 100 BCE. - MEXIQUE : Quintana Roo - The remains of a prehistoric child were removed from an underwater cave in Mexico four years after divers stumbled upon the well-preserved corpse that offers clues to ancient human migration. The skeletal remains of the boy, dubbed the Young Hol Chan, are more than 10,000 years old and are among the oldest human bones found in the Americas. The corpse was discovered in 2006 by a pair of German cave divers who were exploring unique flooded sandstone sinkholes, known as cenotes, common to the eastern Mexican state of Quintana Roo. Scientists spent three years studying the remains where they lay before deciding it was safe to bring the skeleton to the surface for further study. The Young Hol Chan, named after the cenote where he was discovered, was found in a darkened cave 27 feet beneath the surface. - U.S.A. : Niles - Yearly digs are conducted at the former site of Fort St. Joseph in Niles, in efforts to learn more about the centuries old structure. Piece by piece, dig by dig, a place lost in history is coming back to life. Fort St. Joseph is hundreds of years old. This is a really interesting archaeological site for a number of reasons. One is its relatively undisturbed, another is it's a fairly rare site in Michigan. There aren't many 18th century sites. It's believed the fort was used for fur trading. - ITALIE : Rome - 24 august 410 : the first sack of Imperial Rome by an army of Visigoths, northern European barbarian tribesmen, led by a general called Alaric. - GRECE : Ithaca - Greek archaeologists have claimed they have found the palace of Odysseus during excavations on the Ithaca island in the Ionian Sea. Thanasis Papadopulos, who has been leading the excavation team on Odysseus' home island for 16 years, said that he knew the right place of the remains since 2006. “We found the ruins of a three-level palace with a staircase carved into the rock,” Papadopulos said, adding that they also found a well, dating back to 13th century BC, when the Trojan War is believed to have taken place. According to the archaeologist, the discoveries are identical to the ones described in Homer's Odyssey, presumably written about 8th century BC. - CANADA : Beaubassin / Fort Lawrence - In a huge hayfield straddling the border of New Brunswick and Nova Scotia not too far from Moncton, some long-buried relics of history have been uncovered by participants in a public dig program at the Beaubassin and Fort Lawrence National Historic Sites . It was first occupied by aboriginal peoples over 3,000 years ago, then by Acadian settlers in the 1600s and later fought over. Beaubassin was one of the largest Acadian settlements in the new world. But it was burned to the ground by raiders from New England in 1696, rebuilt, burned again by the French in 1704, rebuilt by the Acadians and destroyed again in 1750. So, as Burke says, there are many layers of history here, all blended together as the same rocks were likely used for foundations each time it was rebuilt. Scavengers, farming and construction of the rail line through the area also churned up the soil. ocated on the Fort Lawrence Ridge, the lands also include Fort Lawrence National Historic Site (1750-1756), designated in 1926. The property includes a significant portion of the former Acadian village, including the ruins of the Acadian cemetery and Fort Lawrence. The architectural ruins and features of the village, burned in 1750, attest to the Acadian way of life . - CHINE : Artificial planning and fake artifacts were part of the discovery and excavation of a supposed ancient tomb claiming to belong to Cao Cao, a warlord in the Three Kingdoms period (220-280), a group of experts and scholars announced over the weekend. The ancient tomb complex was unearthed in December. It included three ancient corpses, one man and two women. The man died in his 60s, the same age as Cao Cao when he died. - BAHRAIN : Archaeologists have uncovered the remains of a 400-year-old palace close to Bahrain Fort, which are believed to be ancient steam rooms and the discovery has been described as "extremely unique". Experts believe the palace dates from the late 16th century, but mystery surrounds the identity of its former owner. - ROYAUME-UNI : Cockermouth - Work began in a field near Papcastle in Cockermouth after the floods in 2009 exposed the remains of a settlement. 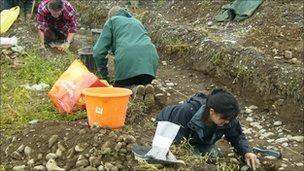 The artefacts, including pottery and glassware, are around 1,700 years old meaning the Roman fort on the site was more extensive than experts believed. It is showing the Roman presence in Cockermouth was far more extensive than was believed with the settlement stretching down to the River Derwent. 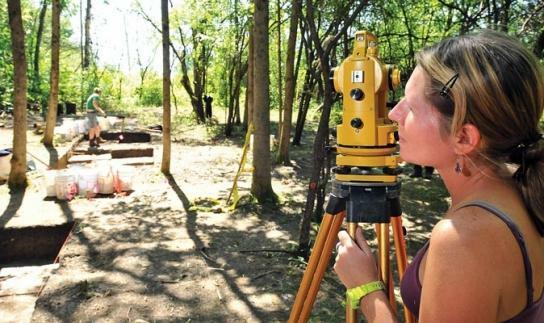 - U.S.A. : Middlebury - Archaeologists started their work last year, they already knew about a 19th-century mill closer to the river. But after digging test holes in a clearing next to the substation, they discovered possible evidence of prehistoric fire pits and tool-making in the woods off to the side of the substation. The site is more characteristic of a temporary settlement than a village, but only further exploration will reveal the time period when the site was used, the purposes for which it was used, and whether it was simply an overnight camp or served as a more permanent residence. For now, they are working specifically on two areas: one a potential fire pit close to the cliff face, with evidence of cracked and reddened rocks, and the second a tool-making station further away, where they have already found thousands of rock fragments from chipping away at arrowheads and other tools. - U.S.A. : North Creek Shelter - Ancient Americans added a new item to their daily menu about 10,000 years ago when the grinding stone used to make flour appeared. Brigham Young University scientists excavating one of the oldest known sites occupied by humans in what is now Utah found stone tools used to grind sage, salt bush and grass seeds into flour. Before the appearance of grinding stones, evidence at the dig site shows the menu contained duck, beaver and turkey, with sheep becoming more common later on. And deer was a staple at all levels of the dig. The grinding stones would have meant more diet options -- probably not bread, but at least a mush or porridge made from milled and ground seeds. Ten thousand years ago, there was a change in the technology with grinding stones appearing for the first time. People started to use these tools to process small seeds into flour. - THAÏLANDE : Several archaeological materials excavated from various sites in Thailand have been found to be "stunningly" similar to ones found in Tamil Nadu and Andhra Pradesh throwing light on trade with south east Asian countries centuries ago. Many materials including seals used by Kings, beads, and pottery with brahmi inscriptions were of Indian origin and these could be assigned to second-third century AD. Quite interesting among the findings is a gold plaque with brahmi letters.The letter found on the plaque like "ti" (in looped form) is found only in (excavated materials) Tamil Nadu and Andhra Pradesh. The plaque belonged to a shipman (Naaviga which later became Navigator) Brahaspathi Sarma,name common only to South India.This was found in the ruins of a Buddhist temple in the Northern district of Wellesley (Thailand).This also proved that India had trade with the country centuries ago. Similarly the triangle head is a standard symbol found on the bull type and elephant type coins of Satvahana Rulers at Nevesa and Sannati (Thailand). The same symbols were found in Sangam coins with others such as Triangular Geometric design. A seal found near Arikamedu (in Tamil Nadu) also had depiction of this symbol. Many seals had similar Brahmi letters to those excavated in areas like in South India.In addition to seals and coins, rouletted wares of Indian origin were also found. Similarly, in India, excavation at Kottapattinam (in Tamil Nadu) located on the East coast yielded many shreds of celadon produced from the Si Sachanarai Kilns of Thailand. The bowls had carved decorations and the Lotus pattern,was the most common. Large glazed and unglazed jars similar to those in Thailand were also found in Tamil Nadu and Andhra Pradesh. - TURQUIE : Pompeiopolis - New inscriptions have been unearthed during excavations at the ancient city of Pompeiopolis, in Taşköprü in the northern province of Kastamonu. Pr. Ch. 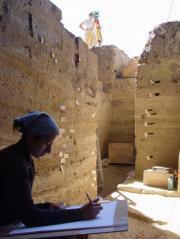 Marek, who has been examining the inscriptions, said they were probably referred to festivals from the Roman era. Marek said that according to the inscriptions, Roman emperors participated in these festivals, most of which were religious. Marek said several competitions, shows and plays were held as part of these festivals, which are thought to have been started by Roman Emperor Alexander Severus. "There were… competitions and music shows, as well as tragedy and comedy shows in the festivals. These festivals were organized every three to five years and hosted significant people of the period," he added. According to historical records, after winning the battle against Mithridates Pontius Pilate and his army in the northern valley of Gökirmak in 64 B.C., the Romans settled in this region. 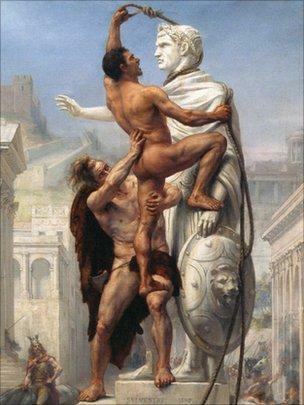 The Roman commander Pompeious built a city on Zimbilli Hill and called the city Pompeiopolis.